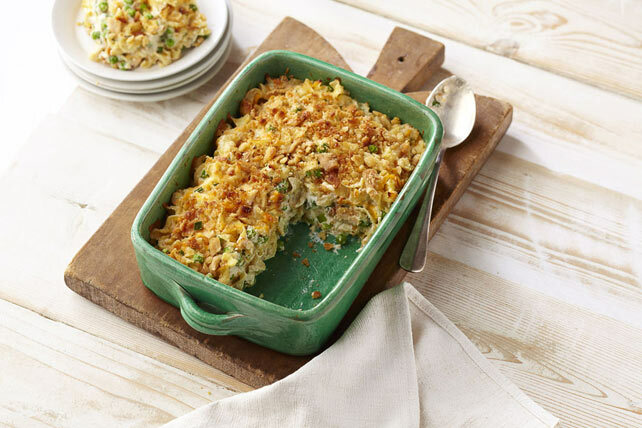 Tuna casserole is a retro weeknight classic. With a crisp and crunchy cracker topping, our recipe uses cream cheese to make a simple, but tasty, sauce. Cook noodles as directed on package, omitting salt; drain, reserving 1/3 cup cooking water. Mix cream cheese product and milk until blended. Combine noodles, reserved cooking water, tuna, peas, onions, shredded cheese and cream cheese mixture; spoon into 2-L casserole dish sprayed with cooking spray. Cover. Stir casserole gently; top with crumb mixture. Bake, uncovered, 8 to 10 min. or until topping is golden brown. Garnish with 1 Tbsp. finely chopped fresh parsley before serving. Prepare using Philadelphia Herb & Garlic Light Cream Cheese Product or Philadelphia Dill Cream Cheese Product.